The clouds have parted, and I have enjoyed 2 cold, clear nights of astrophotography back-to-back! This is a fortunate occurrence that doesn’t come very often, especially during a Canadian winter. However, the moon is nearly full, rising in the late evening in it’s waning gibbous phase. This reminds me of a question that comes up time and time again. 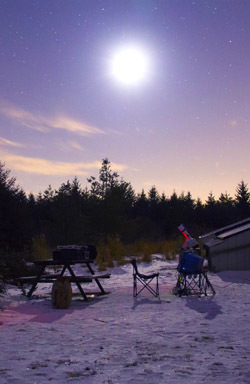 Is deep-sky astrophotography during a full moon a waste of time? The moon reflects bright sunlight into the sky for about a week on either side of a full moon. This moonlight floods the sky and is so bright that it washes out faint deep-sky objects, both visually and photographically. The week surrounding a full moon used to mean a break from imaging faint deep-sky objects. After New Moon, the nights that followed would get me down as the waning crescent moon grew brighter and brighter each night. I knew that my astrophotography adventures would be put on hold for at least 2 weeks. 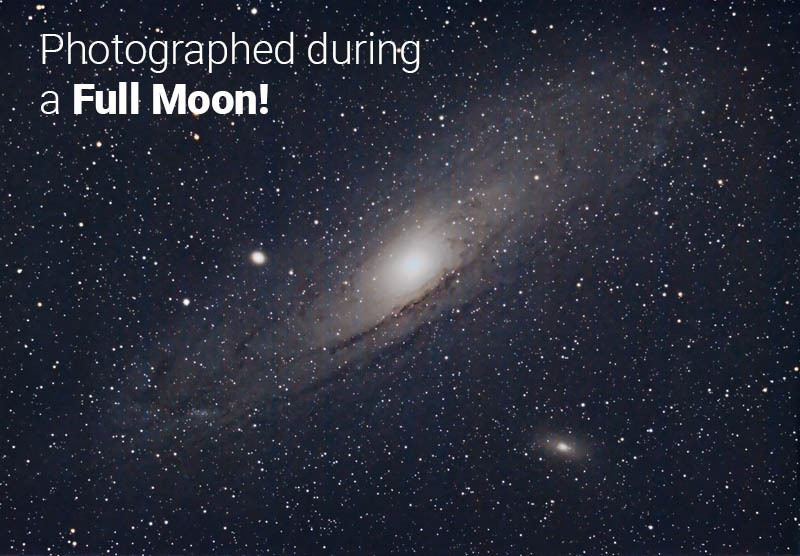 Images taken under the bright glow of the moon have less contrast, detail and can quickly become overexposed. It is possible to reduce the moon’s effects with careful post processing, but you’ll never capture your best full-color images during this time. For those reasons, the moon kept the cap on my telescope lens. Not anymore! With the purchase of my Narrowband DSLR H-Alpha filter, I was able to double my time under the stars. 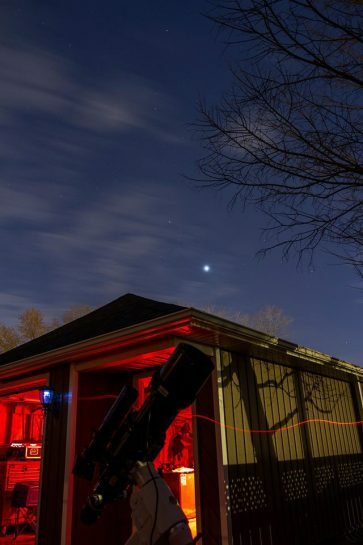 The image above shows the planet Venus over my garage and telescope. I wouldn’t recommend shooting a faint nebula (such as the Bubble Nebula) during the full moon without a narrowband filter. However, it can be hard to disregard a clear night, no matter how bright the glow of the moon is. You can improve your chance of success by shooting objects well away from Earth’s natural satellite. On January 14th, 2017, my target was a little closer to the moon than I would have liked it. I would not have attempted this deep-sky target had I not been using a narrowband H-Alpha filter. When the moon is out, I shoot Narrowband Ha. When it’s not out, I shoot RGB. HaRGB composites have proven to be a fantastic option for astrophotography in the city. The filter blocks out the light-pollution us deep-sky imagers are accustomed to in our suburban backyards. At a bare minimum, I would recommend a light-pollution filter if you are imaging in the city. The filter I use is an IDAS Light Pollution Suppression Clip-in filter for my Canon DSLR. But what about shooting without any filters, is it a waste of time? Not necessarily, but there are some guidelines to follow that can increase your chances of producing a quality astrophoto from your imaging session. Moonlit nights are the perfect opportunity to try something new with your equipment. Save Nebulae for New Moon, Shoot Star Clusters! I am personally guilty of neglecting these beautiful targets in Liu of colorful galaxies and nebulae. There are countless open and globular clusters to photograph and add to your collection. 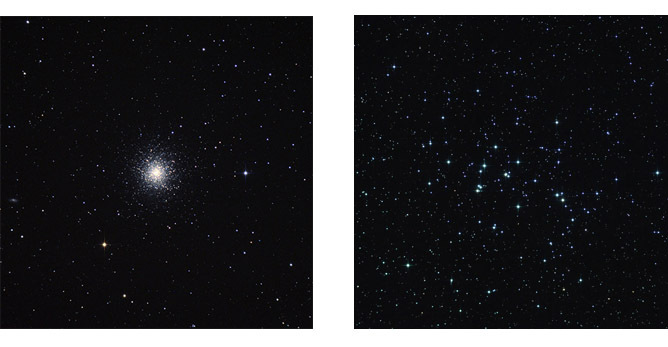 In my experience, star clusters are best captured by using short exposures (30 seconds – 1 minute). This way, the bright stars are no blown-out, and you can record sharp colorful stars in your image. Shooting shorter exposures and stacking them have some advantages over shooting fewer, long exposures. Although the individual frames will not record as much detail on your DSO, the background sky, and stars will be less “intense”. What I mean is, it will be much easier to set the black point while processing your final stacked image, and bright stars will not “take over” as they would in a long exposure of 5 minutes or more. The signal-to-noise ratio will also improve as you add more subs to your final image. These principals apply to images taken during any moon phase, but are especially effective when dealing with added moonlight. If you are anything like me, the thought of missing out on imaging time during a clear, moonless night is painful. 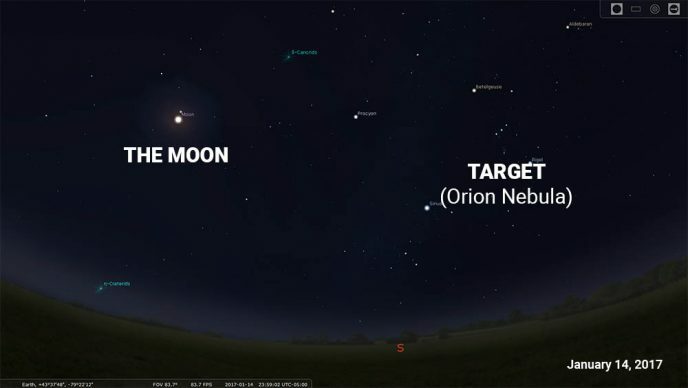 But with the Moon out, you can enjoy some guilt-free visual observing! The fainter objects will be a challenge, but star clusters, bright galaxies, and planets (and the Moon!) will be unaffected. Take some time to remember why you got into this hobby in the first place. With so many amazing winter astrophotography subjects currently up in the sky, choosing a target can be a tough decision. 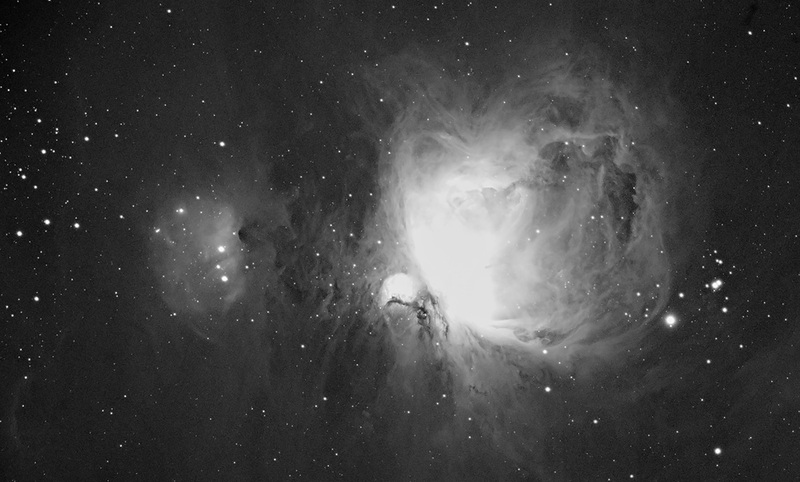 I opted for one of the most well-photographed nebulae of them all, the Orion Nebula. If you read my last post, you’ll know that I consider Messier 42 to be the best deep-sky astrophotography subject for beginners using a DSLR and telescope. Over the years, I have soaked hours and hours of exposure time into this nebula, but this time is different. The image above is 32 X 5-minute subs @ ISO 1600 using a Canon Rebel T3i and Astronomik 12nm Clip-In Ha Filter. As you can see, an incredible amount of detail was captured on this target despite the nearly full moon and heavy light pollution. Using the HaRGB Image processing technique outlined in my latest astrophotography tutorial, I was able to combine this data existing RGB (full-color) images taken back in December. I waited far too long to incorporate a narrowband filter into my DSLR deep-sky imaging. One of the main reasons I put this off was a confusion about how these filters worked when imaging with a DSLR camera. There are 2 types of narrowband filters that can be used with a DSLR camera. The first type is my personal favorite option – a clip-in filter that installs directly over your camera sensor. These are convenient but can be expensive. The Astronomik 12nm Ha Filter was more than $200 after tax and delivery (Oceanside Photo & Telescope). The second type is a traditional type of telescope eyepiece filter (either 1.25” or 2”) that threads into the end of your camera adapter and inserted into the focuser draw tube. Early on, I thought narrowband astrophotography was reserved for owners of CCD astrophotography cameras. I am delighted to announce that this is not the case. A fellow astrophotographer friend uses the 1.25″ Orion Narrowband Ha filter and has experienced promising early results. I recently met with a group of amateur astrophotographers to share our astrophotography processing tips and tricks. It was an enlightening experience, and I learned some great tips for processing deep-sky images using Adobe Camera Raw, and stacking in Adobe Photoshop. This alternative image processing technique includes pre-processing each frame in Adobe Camera Raw and using the stacking feature built into Adobe Photoshop to produce the final image, rather than DeepSkyStacker. The noise-reduction, gradient removal, and chromatic aberration corrections were impressive and worthy of some future experiments on my own deep-sky images. This is a valid second option to my traditional image-processing workflow, and I will share my results. On night 2 of my astrophotography double-header, I changed gears and pointed my telescope towards NGC 2244, the Rosette Nebula. I captured over 2 hours worth of exposures in H-alpha. I’ll share that photo and my processing notes later on this week. Until then, keep on shootin’. I am an old kanuk stuck down here in Australia, specifically the west coast off Perth. Will get back home one day, soon. From your comments above, the Ha clip-in filter is being used without any other changes to the cam? I have a 600D, but have been reticent to modify it (permanently). I have been in the game for many years in my (youth), then other interests took over for a while. Going digital has stirred the old fire again. Thanks for the quick reply, Trevor. I kinda suspected it would mean surgery. Might be better to find a 2H cam & modify, or purchase a dedicated astro cam. May I complement you on an excellent site. Have been following for some time, now. I meant to comment before, but got carried away with the request. My first intro to astronomy took place in (or just west ) of Malton. We had an acre just north of the old airport, back in the days of the Avro Arrow. Dad let me use his (pride & joy) 7×50 binocs. Never really stopped looking since. Anytime Pete. I love hearing how people got the itch. My story was similar, using my Dad’s ultra-heavy 10 x 50 Tasco Binoculars to look at the Moon. Clear skies! 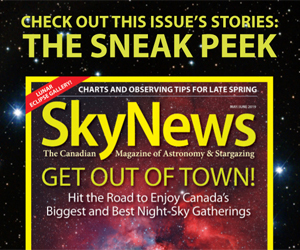 Another nice article Trevor; Most of us now live in light polluted or very light polluted skies. Filters can make a very big difference in your image. I started in this hobby back in 1982. The visual side of the hobby is one thing. The art and science of imaging is quite different. I have been imaging about two years now and this is what I have come away with. It’s time consuming, frustrating at times, and rewarding when things go right. Thanks to people like you, that want to share information anyone can improve by implementing some or all of your ideas. Like you said in your article there are other things to shoot besides deep sky objects, although this is what most of use like to do. Use the light around you as a tool not as your enemy (it’s not going away). Mother Nature can and will show you many great things but she’ll make you work for it. Trevor; thanks for all of your time and post. Thank you, Terry for the wise words! You’ve been at this hobby since before I was born! To me, that’s a good sign that astronomy and astrophotography is a lifelong passion that continues to reward those who are persistant. It’s a big universe out there, that offers unlimited areas of interest and study. Thank you again, and clear skies! Thanks a lot for your Youtube tutorials and blog. I just happened upon the videos in the November mainly for processing info and have been loving all of them. I now use Astrophotography Tools and Gradient Exterminator in addition to PS, Startools, and LR2. I have an Orion ED80 F7.5 refractor for my imaging telescope with the Sirius (HEQ5) go to mount and for imaging I use a modified T3i. I recently had it modified by Hap Griffin and turned out to be one of the best things i have done. I have a 48mm Astronomik CLS fliter, UHC Clip filter, and an OWB Clip filter. I don’t think I will be doing the Ha imaging anytime soon however but who knows. Thanks again! Right now I am inside using Team Viewer imaging the Rosette Nebula using the UHC filter (180 sec exposures). I should get about 1.5 hours of data tonight. I’ll try to get more maybe tomorrow but the weather has been awful lately. Wow, Kurt, our setups are remarkably similar! Thank you for the kinds words. I hope your data on the Rosette turned out well! Keep in touch! I was pretty happy the way the Rosette came out. 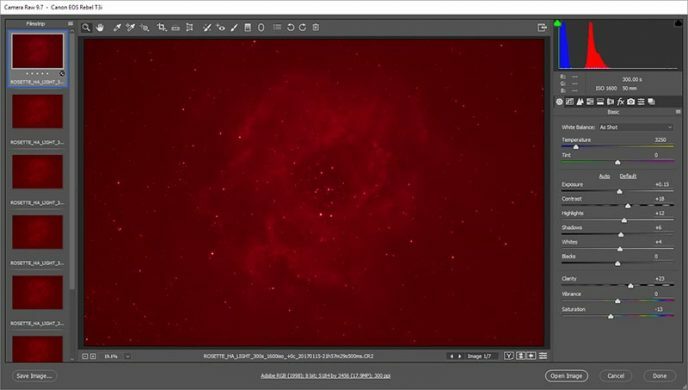 Hey Trevor, was thinking of going for the rosette nebula (moon is out Hense why I ended up here) with a 600D but it’s not modified, will much come of it from a stock camera it being a very red nebula? With enough exposure time, yes! My original Rosette Nebula used in my processing tutorial video was shot using a stock DSLR: https://youtu.be/jqZREcJ54tY However, the moon will definitely make things more challenging. I’d stick with narrowband (specifically h-alpha) when the moon is near full or close to your target.